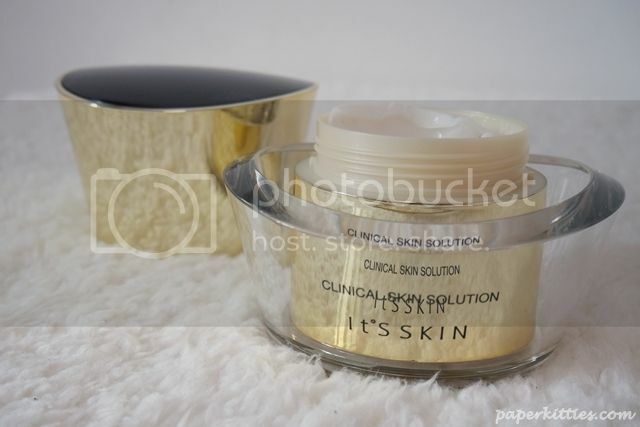 Luxurious skincare in a glamorous gold packaging anyone? When I first laid eyes on it, I immediately thought of how lovely an indulging gift it would be for my mom! 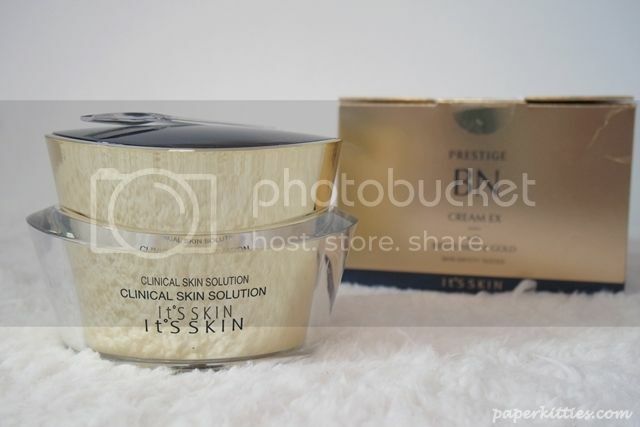 The It’s Skin PRESTIGE BN Cream EX with bird’s nest & gold is a whitening and anti-wrinkle cream that targets dull skin, evens skin tone and boosts radiance. This product prevents dark spots from emerging and reduces the appearance of fine lines. It contains 5% bird’s nest extract and 0.01% gold. The design of the Prestige BN Cream EX with Bird Nest & Gold is really unique: removing the massive cap gives the bottle a hollow sphere with the actual product sitting in the middle. It also thoughtfully comes with a spatula for you to scoop the cream whenever necessary. I personally love the subtle scent that strangely reminded me of ginseng, hees. Aren’t those gold flakes just so gorgeous?! The product easily spreads out smoothly onto my skin; texture wise it is pretty rich and takes awhile for the product to be fully absorbed, with a slight greasy afterfeel. If your skin steers towards the drier side, I would reckon that this does a pretty good job in moisturizing it. But to be honest, I personally won’t use it at the moment since fine lines and wrinkles are not my main skin concern, and that it would be better suited for a more mature audience – like my mom.